Conwy Castle is a large defensive structure, built in the 1280s, which dominates the North Wales town of Conwy. It’s notable for how much of it still remains and the railway line which runs alongside and even underneath it at one stretch with battlements to match. It has several turrets which make it quite striking to look at because they are so tall. Most of the turrets can be climbed with the network of spiral staircases and when you get to the top, they all have a terrific view of the harbour and the other buildings in the town. You can also see the three bridges that lead from the castle, one carrying the road, one for the railway and the other is a footpath. 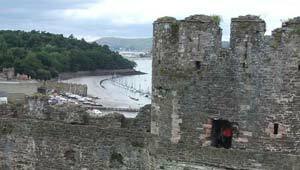 We’d thoroughly recommend a visit to Conwy castle because it has so much to see. Our visit lasted several hours, although we had a picnic in the grounds, and you need to allow enough time to see it all as it is quite big. Although most of the interior of the castle has been lost, you can easily make out the holes in the walls where floor beams were once fixed which helps you to visualise how it would have looked in its heyday. If you have children, they will love it because much the information is geared towards them and they will enjoy climbing up and down staircases and battlements. It reminded us a little of Hogwarts! Look out too for the impressive sculpture inside one of the turrets which is made up of swords, shields and axes and has a crown on the top. One word of warning, the spiral staircases are quite cramped and you’ll need to be careful not to slip. Make sure you use the hand rope to support you. Conway Castle is open daily. Hours vary depending on the time of year, in July and August it’s open from 9.30am to 6pm, in March, April, May, June, September and October it’s open 9.30am to 5pm. Check with the castle for details of winter opening. Adult admission is £4.80 but the best value is the family ticket at £13.90 (2012 prices). After visiting the castle, don’t forget to spend some time visiting the ancient walls of the town which are all interlinked and join on to the castle itself.